Vineyard/Varietal: 83h red – Grenache 55%, Syrah 20%, Mourvedre 15%, Cinsault 5% , Carignan 5%. 4h white – Grenache 40%, Roussanne 30%, Viognier 30%. In 1947 Andre Brusset founded the vineyard, set among olive and apricot groves, becoming one of the first in the southern Rhone to estate-bottle his wines. In 1986 his son Daniel bought the abandoned but now famous south-facing Gigondas terrace-vineyards on the Dentelles de Montmirail. Today, Laurent, the third generation of the Brusset family, meticulously crafts wines with charm, depth, and complexity. All grape varieties are hand-harvested separately, de-stemmed, fermented on their natural yeasts, slowly and softly, with maturation on the lees. Cairanne Cotes du Rhone Village “les Travers” Blanc, 2015….. With its heady bouquet of fruit paste, this white wine is sweet-smelling but refreshingly crisp and dry – 20% fermented in new barrels, no malo. 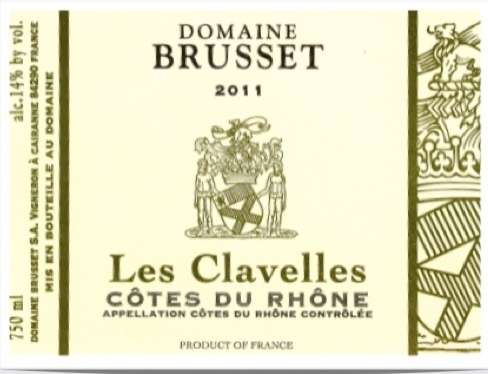 Cotes du Rhone Viognier ‘les Clavelles’, 2015…..The rarest wine of Brusset, this low-yielding Viognier comes from a steep sandy-clay slope. Hand-picked, then natural yeast-fermented, partly in oak barrels, partly in tank. Ripe and concentrated, heady bouquet and flavor of white peaches and apricots. Cotes de Ventoux les Boudalles Rouge, 2015…..A Grenache-based vineyard near Carpentras on the slopes of the Mont Ventoux, aged in vats for six months – a delicious bargain. Cotes du Rhone “Laurent B” Rouge, 2015…..Comparatively low-yields of 45hl/h make this Rhone blend a real gem loaded with red berry fruit and seamless tannins. Cairanne CduR Village “les Travers” Rouge, 2013…..The round stones in the vineyard accentuate ripeness, making for a fuller and more concentrated wine with darker fruit flavors and spicy tannins. Cairanne CduR Village Old Vines “les Chabriles” Rouge, 2013….. South-facing clay limestone terrace planted to 65% Grenache and 35% Syrah – only 28hl/h – intense, robust, and long-lasting. Worthy of high praise. Gigondas “Tradition le Grand Montmirail” Rouge, 2013…..These steep stony terraced vineyards face directly south, planted mainly to Grenache 70%, with equal parts Mourvedre, Syrah and Cinsault. Two-thirds of the wine is aged in tank and the other third in used, large barrels – vibrant mineral textures, jammy fruit flavors, smooth finish. Gigondas “Les Hauts Montmirail” Rouge, 2013…..Just below the famous Dentelles ridge, these magnificent terraces are a wonder to behold – the blend is Grenache 50%, Mourvedre 20% and Syrah 30%. Half the wine is aged in oak barrels, some new, and half in tank.